The market research report “Cosmetic Packaging Market by Type, Material (Plastic, Glass, Metal, Paper), Application (Hair Care, Nail Care, Skin Care, Make-Up) & by Packaging Machinery (Filling, Unscrambler, Sealing, Conveyor) & Geography - Global Trend & Forecast to 2018”, defines and segments the cosmetic packaging & machinery market with an analysis and forecast of values. 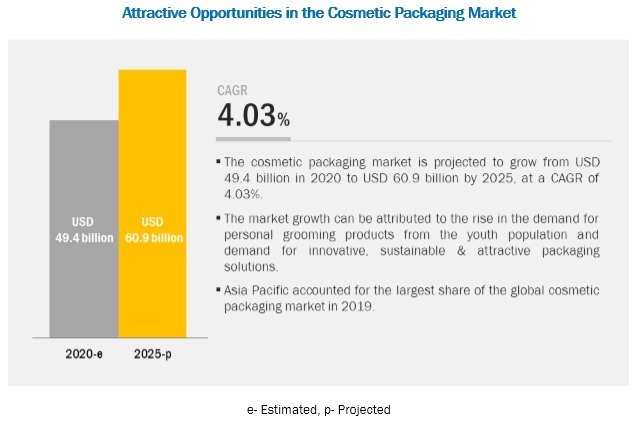 It also identifies driving and restraining factors for the cosmetic packaging & machinery market with an analysis of the trends, opportunities, burning issues, winning imperatives, and challenges. Browse 128 market data tables and 56 figures spread through 383 pages and in-depth TOC on "Cosmetic Packaging Market by Type, Material (Plastic, Glass, Metal, Paper), Application (Hair Care, Nail Care, Skin Care, Make-Up) & by Packaging Machinery (Filling, Unscrambler, Sealing, Conveyor) & Geography - Global Trend & Forecast to 2018"
Cosmetic packaging market is a growing sector that has various stake holders such as raw material suppliers, processors, cosmetic and cosmetic packaging manufacturers; with the market for cosmetic products rising, players in cosmetic packaging industry are struggling to diversify their product portfolio. An efficient and suitable packaging is essential for all types of cosmetics. Plastic is the most preferred material. Consumer preferences, product characteristics, and material compatibility are essential in determining the type of packaging for the products. Asia-Pacific is a significant market share holder and an impacting driver. Asia-Pacific has the highest market share and is projected to be the fastest growing market. The potential markets for cosmetic packaging include India, China, and Brazil which are poised to exhibit the fastest growing trend.